WASHINGTON, D.C. – A top Saudi official appealed to U.S. lawmakers who are considering sanctions on Saudi individuals connected to the murder of journalist Jamal Khashoggi to let a judicial process run its course before taking action. “I wish the Congress would take a step back, look at the overall relationship, look at the steps that Saudi Arabia has taken, and let the process play out,” Saudi Minister of State for Foreign Affairs Adel al-Jubeir told reporters on Friday. “Judge us when it’s complete,” he said. Al-Jubeir’s visit coincided with a deadline imposed on the White House by Congress to issue a report on whether Saudi Arabia’s Crown Prince, Mohammed bin Salman, was responsible for Khashoggi’s death. The White House blew past the deadline, triggered 120 days ago by a bipartisan group of senators who used the Global Magnisky Human Rights Act to force the president to determine if a foreign person was responsible for a human rights violation. The White House indicated the president could decline to respond to requests from Congress. Democratic Senator Patrick Leahy of Vermont said in a statement that the act had not triggered a “request,” but rather, a legal mandate. “If the President ignores the clear mandate of the Magnitsky Act in a case involving premeditated murder perpetrated by officials of a foreign government, the White House will share the blame for attempting to cover up the crime and for helping those responsible evade justice,” Leahy, who was among the group of senators requesting the probe, said. Khashoggi was murdered at the Saudi embassy in Istanbul, Turkey on October 2. Saudi Arabia’s public prosecutor has indicted 11 Saudi nationals for the murder and requested the death penalty for five of them. The CIA has issued an intelligence assessment indicating the Crown Prince ordered the murder – something Saudi Arabia has consistently denied. “This was something that was done outside the scope of authority and so we’re now investigating, and those responsible will be held accountable,” al-Jubeir said. Al-Jubeir declined to respond to a New York Times report that the Crown Prince told an aide in 2017 he would use “a bullet” on Khashoggi, according to communications intercepted by U.S. intelligence agencies. He also dismissed outside calls to have the Crown Prince step aside. 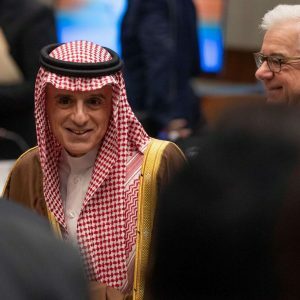 Al-Jubeir expressed less concern about the numerous press reports in recent months indicating that the crown prince’s personal communications were being routinely intercepted by U.S. and foreign intelligence agencies. “I think that’s what intelligence agencies do,” he said.